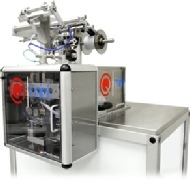 The QuickPouch - Mini table top form fill seal machine - pouch former and liquid filler, compact table top. For vertical form fill seal packaging of small sample size foil bags. Ideal size is 2 x 3 inch bags, can make up to 4 x 4 inch bags. 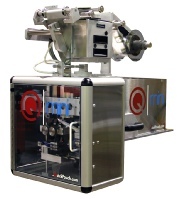 The QuickPouch - Mini can be a standalone vertical form fill seal machine with its own pump. It can also be integrated with loading equipment, performing automatic vertical form fill seal packaging. Eyespot for pre-printed rollstock. Call us to discuss your application.